The attractive, all anodized aluminum Green Spot is the simple and reliable answer to today's solvent-free manufacturing environment. Assembled with state-of-the-art components, it provides reliable and powerful spot curing every time. Its flexible wand delivers dedicated, concentrated UV spot curing where it's needed, and its compact size (9.75 x 12.5") is ideal for R&D or other manual operations. And a unique "pop-off" lid allows this UV spot cure device to access the lamp reflector assembly, a big feature for intensive manufacturing line operations where downtime maintenance must be kept to a minimum. This feature allows the user to change lamp reflector assemblies in less than a minute. 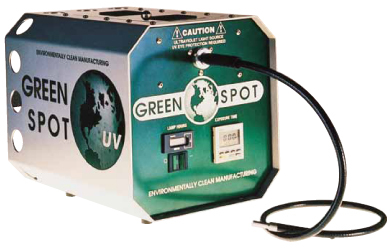 The Green Spot UV curing system uses an industry standard super-pressure mercury 100-watt lamp, mounted vertically, in a dichroic-coated elliptical reflector to generate an intense, consistent, 5mm spot of light in the UVA, UVB, UVC and visible ranges. Powered by a solid-state, power-regulated power board, the Green Spot maintains 100 watts of continuous power to the lamp. It also features a gravity-close shutter system for safety to the operator and reduced risk of the shutter being stuck in the open position. To learn more about the Green Spot UV Spot Curing System, including technical specifications, please visit our technical library where you can download and print literature. Total weight under 14 lbs.